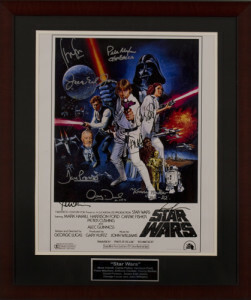 This Star Wars autographed movie poster will be up for grabs in the 2013 Oscar week trivia contest from Charity Fundraising. International provider of silent auction items celebrates Oscar Week in style with unique contest on their Facebook Fanpage February 18-22. Fort Lee, New Jersey – February 12, 2013 Charity Fundraising is pleased to announce the annual Movie Memorabilia Giveaway in celebration of 2013 Oscar Week. The international provider of silent auction items and fundraising ideas will host a trivia contest on the company’s Facebook Fanpage. The 2013 Oscars are on Sunday, February 24th. Beginning Monday, February 18th through Friday, February 22, Charity Fundraising will post trivia questions each day. The first person to post the correct answer to the question will receive that days prize of an authentic piece of autographed movie memorabilia. The Fundraising Manager at Charity Fundraising shares, “We love hosting contests like our annual Oscar Trivia Giveaway. It creates excitement around the Oscars and allows us to showcase some of our one-of-a-kind autographed movie memorabilia. Additionally it allows us to showcase our wonderful charity partners and encourage other non-profits to partner with us.” Charity Fundraising offers include movie memorabilia featuring, The Hunger Games, James Bond, Batman, The Lord of the Rings and Twilight.